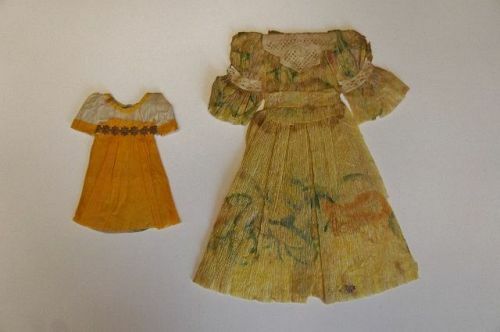 Here are two very nice paper doll dresses made with crepe paper and Dresden paper lace trim from the 1840's The 7" dress is exquisite with watercolor hand painted floral decoration. This dress has a partial unbleached paper backing that is all original. It has a slightly irregular hemline and a dark spot just above the hemline. The smaller dress is 3 1/2" and has Dresden stars across the bodice. It has a paper back that is two fold to go over the paper dolls head. These two were in the same lot as the other offering of 8 dresses and all made by the same hand. This is a very choice lot.